Dentistry allowed me to make a very big impact for so many people. For some, it is regular maintenance, while for others, it was a life-changing experience. Over the course of the past several decades, my clients have made a difference in my life. I'm certain that my team and I have made a difference in their lives as well. They've come to expect a lot from us, and as our vision has stated, I believe that each one of you deserve the very best. As with anything in life, there are seasons to enjoy. That may sound funny here in Tucson, but you know we experience them too. My clients continue to mean so much to me now that I transition to a different season in my life. It's time to wind down my practice of dentistry. Oh, sure, it'll always be a part of me and I'll be around here and there. As many of you know, I have numerous hobbies and interests, and I look forward to enjoying them with increased enthusiasm. The great new for you is that I've searched for the right person to take over the dental care of my patients. After meeting and interviewing with several candidates, I selected Dr. Elahe Wissinger to represent the "McMasterpiece" work that my patients have come to love. Dr. Wissinger has been practicing for 21 years, and I feel her knowledge and technology in the advancement of dentistry will provide an even greater advantage for your dental care. Please know that you are in exceptional hands as the legacy carries on. And as always, keep your smile and dental health something to be proud of! 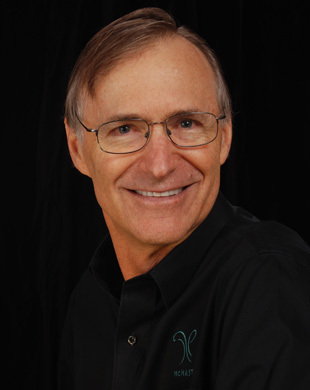 Dr. Doug McMaster practiced restorative dentistry in Tucson since 1981. His interest in dentistry began as a child. His father was a dentist, then an orthodontist. He influenced him in the sciences, and was raised using his hands with tools, both large and small. After obtaining a degree in chemistry at the University of Arizona, he attended the University of the Pacific to complete his formal dental education, and graduated with a Doctorate of Dental Surgery. His skills were continually and significantly enhanced by attending programs at the Pankey Institute, Seattle Institute, and Kois Center. Dr. McMaster held a career-long membership in the American Dental Association, the Arizona Dental Association, and the Southern Arizona Dental Society, as well as in the Academy of General Dentistry, from which he received a fellowship award. He also maintained constant membership in the American Academy of Cosmetic Dentistry. In 2007, he attained “Sustaining” membership in the American Academy of Cosmetic Dentistry by passing a rigorous examination. He had been restoring teeth with porcelain veneers since 1988 until his retirement in the summer of 2017. Dr. McMaster taught clinical dental hygiene at Pima Community College for several years, and was constantly involved with numerous local dental study clubs, so he can interactively share his knowledge and experience with colleagues. Up until his retirement, he served as a Mentor at the Kois Center in Seattle. Since the early 2000s, he also served on the Arizona Council for Dental Education, including as chair of the council, which helps bring the highest level of continuing education to the dentists of Arizona. In 2007, Dr. McMaster was named “Dentist of the Year” by the Arizona Dental Association.